"and tell me what street, compares to Mott Street in July, sweet pushcarts gently gliding by . . .?" I spent some time in New York but never saw Mott St. Where is that? In Manhattan? I love the car light that helps to illuminate this shot. Mott St is downtown in Little Italy/Chinatown, parallel to Mulberry St, between Houston and Canal Streets in Manhattan. The area has changed so much in my relatively short time in the city, from utilitarian Italian to artisan shops selling expensive clothes and jewellery etc. Thank you Emilio and do hope you enjoyed your time in the city where there will always be more for you to explore next time you visit! Surprised that no one ever mentioned Little Italy while we were there. Must go back! Next time Emilio though to be honest I’m not that sure you missed much, as far as Little Italy is concerned which is now a shadow of its former self . . . Very true, Patti. Every time we’re there, it gets harder to even find Little Italy, as it’s being swallowed up by Chinatown. Still one of the great places in New York, though. I hate seeing the waiters at the Italian restaurants there hustling for the poor bewildered tourists looking for that dose of NY Italian when I suspect the restaurants all share one common kitchen out the back – like the Russian restaurants out on the boardwalk at Brighton Beach! As you say though, still a great place to visit! Charles, do you have a favorite restaurant to recommend? I try to refrain from recommending restaurants, Patti. It never ends well. Also, I don’t think there’s a restaurant in Little Italy that I’ve been to more than once or twice, so I don’t feel qualified to even try. You, or some of your readers, probably know more than I do. One man’s meat is another man’s poison . . . Thank you dear Margie, season’s greetings to you! Beautiful composition, Patti, with lots of nice details. You have a very good eye for moments and situations. Thank you so much Stefan for your very kind comment! Nice shot Patti. 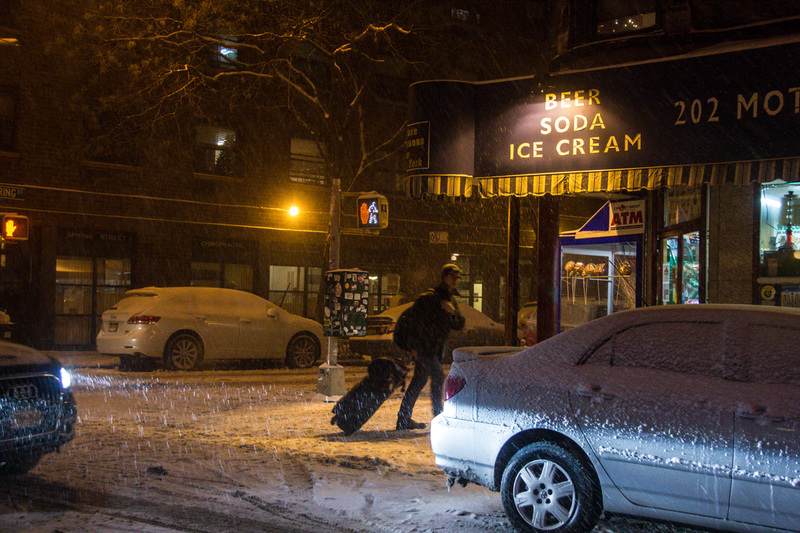 Beer, soda, ice cream and snow. With elements like these, who needs the periodic table? Seasons Greetings. Wishing you all best Lignum with beer, soda, ice-cream, sunshine and cool breezes. Thank you so much! Lovely shot- like a winter-y Edward Hopper! Thank you so much doublewhirler for your lovely comment! The more snow the better. With 40c+ expected today, I’ll linger near this lovely photo together with a fan on full blast. Thank you Patti for the Christmas cheer. Gerard, 40 degrees . . . that can’t be pleasant. Perhaps you may find comfort and cheer in the shade with a mango daiquiri! Everything is perfect, the snow, the night, the light and most of all the sign. Beautiful. Where would NYC be without the corner bodegas, open all hours, all weather! Thank you so much Tom. Keep warm! Great photo, Patti! I love looking at snow…not so much being in it though. I love Cole Porter! Thank you Angeline! I love Cole Porter so much I thought he wrote almost every song in the songbook, which of course I know he didn’t but . . . and would he ever write “boy and goil” to get a rhyme with “spoil”? Merry Christmas to you and your family Angeline! Definitely a very different memory in July, Meredith! As for the possibility of snow-crossed lovers, what snow? Thank you for your Christmas wishes Meredith and wishing all best for you! Lyrics by Lorenz Hart! Lovely photo. Thank you EF for picking that up – I think I have Cole Porter on the brain! I love Hart (“Bewitched, Bothered and Bewildered”), so I like to see him get credit for his stuff. I love Cole Porter too, but he wasn’t a Mott Street kind of guy. That is such a beautiful song, one of so many . . . . I am so grateful to you for the proper channeling of credit where due! You are so right about Cole Porter not being a Mott St kind of guy when he was always down in the depths of the ninetieth floor. Fascinating lives both of them! maybe will be better a hot coffe ……..
With a dash of whiskey! Thank you HG! Where would their cats be without the bodegas? Not sure that 7-11 allows them on the premises! I stood there two weeks ago, nice sunshine, ten degrees celsius. I can’t belive, that you have snow now. Here in Germany, wheater feels like in spring. No chance of white christmas. The weather changes so quickly doesn’t it! Hope you enjoyed your time in NYC and maybe you can come back again one winter for some serious snow in the city. It does happen, but, you never know when! Week-end wishes to you mcralf! Yes and yes, please and thank you! Damn. It looks cold!!!! Once again you capture the essence of the place. And it’s not just the beer and ice-cream that are cold . .. . thank you Derrick! Indeed!! Merry Christmas Patti!! I hope all is well in Gotham. Beautifully detailed shot, Patti – I adore the dynamism of your compositions. Richard, please know how grateful I am for your very kind and encouraging comment. Thank you! I love the colours in this picture…great work, Patti! Thank you so much Geert! classic winter frame – I love this particular corner in SoHo too – great lyric recall ! For not too late on a Saturday night it was SO peaceful and quiet down there . . . . Thank you Pat and trust all is well with you! I remember Mott Street from my time there in the 60s and 70s. I am sure I would not even recognize it! But your photo has an old time feel to it! A glorious new year to you, Patti! The past is such a heady mix isn’t it . . . . but what a view for you to have in your rear vision mirror Annie! Love and best to you for years to come! Madhu, get writing on the screenplay!